Premium Compatible Epson T26xl T2631 Photo Black ink cartridge Replaces Epson 26XL Polar Bear Cartridges. Premium Compatible Epson T26xl T2621 Black ink cartridge Replaces Epson 26XL Polar Bear Cartridges. Premium Compatible Epson T26xl T2632 Cyan ink cartridge Replaces Epson 26XL Polar Bear Cartridges. Premium Compatible Epson T26xl T2633 Magenta ink cartridge Replaces Epson 26XL Polar Bear Cartridges. Premium Compatible Epson T26xl T2634 Yellow ink cartridge Replaces Epson 26XL Polar Bear Cartridges. The Epson XP625 provides flexible printing and takes up little desk space and offers big features such as Wi-Fi connectivity and Epson Connect compatibility which allows you to print from anywhere. It also supports Wi-Fi direct connectivity. Epson XP625 ink cartridges delivers crisp, smudge-proof text and vibrant photographic images that will last for a long period of time. The device has 6.8 cm LCD screen with touch panel and weighs approx. 6.7 kg measuring 390 x 341 x 138 mm. There are two front-loading paper trays, one can handle 100 standard sheets of photo blanks and the other can store up to 20 photo sheets. The printer supports Epson iPrint for easy wireless printing from smartphones and tablets; Epson Creative print to print photos directly from Facebook, and Epson Email print to print from anywhere in the world by emailing photos and documents directly to the printer. It also supports AirPrint and Google Cloud Print. Epson XP625 offers a memory card slot for PC-free operation and a USB host. It also allows you to print photos from wireless PictBridge-compatible cameras. The print speed of this device is 32 ppm for monochrome and colour files having a resolution up to 5,760 x 1,440 dpi. The printer also supports printing on CD and DVD media. It supports automatic duplexer for printing on both sides of the paper and reducing paper wastage. It supports automatic Wi-Fi setup, making it quick and simple to connect to a Wi-Fi network. Epson XP625 is an all in one multifunction printer providing high-quality outputs and other useful features such as scan, copy, automatic duplexing, Wi-Fi connectivity, CD/DVD printing, Wireless PictBridge port, Epson iPrint, Epson Creative print and Epson Email print. The printer also delivers good quality photo printouts, making it a good choice for the students and home users or small office groups. Although it has dual paper trays but due to the limited paper handling capacity and lack of fax feature this printer might not be a good choice for the large business workgroup environment. What causes blurry printouts and how to solve it? Due to damp paper, the prints look blurry. See that the paper is not damp, old or curled. Check that it is loaded correctly. When you use a special paper, load one paper at a time instead putting the entire set into the paper tray. Check the specifications of the paper. It should meet the needs of the printer. For best printouts, use Epson papers. You can purchase these online as well as the Epson XP625 ink cartridges. The paper that you load into the printer has to match the paper type setting in the printer software in your PC. Keep on removing the printer paper from the output tray as soon as the printing is done. It will help give time for the ink to dry out completely. If you use a glossy paper, then do not handle the print out soon after printing. This will give it time to dry. If a high-speed setting in your software is on, turn it off. When dual sided printing is done then smudges appear after printing on the other side of the page because of saturated colours or darker images on the right side. If you are printing a lighter image on one side then print that first. In the printer software, adjust Increased Ink Drying Time and Print Density. Align the print head as it may affect the clarity of printing. The Epson XP625 ink cartridges may clog the printhead nozzles. Run cleaning cycle. Q. Can I trust the quality of your compatible Epson XP-625 ink cartridges to be as good as the original ink cartridges? A. Absolutely! All of our compatible ink cartridges are FSC tested and certified. They are manufactured to work well with your printer and will produce the same quality output as you would expect to get from the original ink cartridges. A. PictBridge connectivity allows your digital camera to send pictures to the printer to print without requiring a computer. You can directly print pictures from your digital camera with the Epson XP-625. Q. Do we get Epson XP-625 ink cartridges of colours other than those mentioned on your website? A. No, Epson XP-625 ink cartridges are only available in cyan, magenta, yellow and black. This is because Epson XP-625 printers, like most printers, use the CMYK(cyan, magenta, yellow, black) colour model for their printer. A mixture of these colours enables the printer to make all other colours. Q. How long would it take an Epson XP-625 printer to print 30 copies of a document? A. Epson XP-625 printers come with a speed of 13 pages per minute for black and white printouts and 10 pages per minute for coloured printouts. Hence, it would not take you more than 3 minutes to print 30 copies of a document with this printer. Q. I recently ordered a multipack of Epson XP-625 ink cartridges. The cartridges were delivered to me on time but, one of the ink cartridges was damaged and leaking. What should I do to arrange a replacement for this faulty item? A. We sincerely apologise for the inconvenience caused. Please contact us on 048 308332211 or email us on info@printerinkcartridges.ie within 30 days of receiving the product. Just have your order details and invoice number ready and we will guide you through the whole process. Q. What are the various paper handling precautions that you must follow to improve the print quality of the printer? Q. Why is it preferred to use only high-quality Epson XP-625 ink cartridges for your Epson printer? What impact will it provide on your documents. A. The range of high-quality cartridges is, in fact, an entire system for preserving and delivering ink consistently. Epson always recommends using good-quality ink cartridges because it uses the inks that are specially formulated to consistently produce good photo quality prints and preserve the long-term reliability of your Epson printers. The compatible Epson XP-625 ink cartridges supplied on site provides the same printing assurance and guarantee the reliability of your printer and prolong its life. When using such products you can be sure that each print will be the same high quality as the last. Q. The colour ink cartridge is expended despite the fact that, I print in black only. Why does this happen? A. To keep the print head clear and ready to print, the printer uses a small amount of ink from all the Epson XP-625 ink cartridges whenever it prints. Epson printers contain a permanent print head that needs to be charged with all the colours to work, even if you select Black/Grayscale, some colour ink is still being used to keep the print head charged. Therefore, once one of the cartridges is expended, the printer signals you to replace the cartridge in order to continue printing. Q. I purchase Epson XP-625 printer and along with it, I purchased Epson XP-625 ink cartridges as well. I did not know that a set of ink cartridges comes along with the printer. Do I have to use the cartridges that came with the printer or can I use the ones I purchased online? A. A set of new ink cartridges are always shipped along with the printer. You should use the Epson XP-625 ink cartridges that have been shipped with your printer. These installer cartridges are made especially for the first installation in the printer. When you install ink cartridges for the first time, ink is charged into the printer. This process uses a certain amount of ink. The installer cartridges have that extra amount of added to the ink levels. Once these ink cartridges have been used then you can replace these with the other Epson XP-625 ink cartridges that you have purchased. Q. I am not able to use the Epson Scan feature for my Epson XP-625 printer using Mac. How can I change the settings? A. Mac OS X Mountain Lion comes with a new feature that is called Gatekeeper. This makes any software verifiable by you before it can be installed or any changes made to your system. You will have to disable Gatekeeper because the older versions of the Epson scan have not been verified by Apple. To disable Gatekeeper, you will have to open the Apple menu. Click on System Preferences followed by Security and Privacy. Now select the General tab. This will help you change the settings of Gatekeeper. Now click on Anywhere and then select Allow From Anywhere. 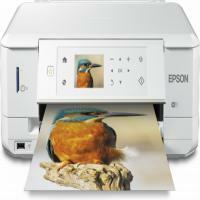 Once you have made these changes, you can install Epson Scan. When the installation is over, you should change the settings of Gatekeeper as these were before. Q. My Epson XP-625 printer does not print colors the way it looks on the screen. Is this problem happening due to Epson XP-625 ink cartridges? A. This problem is not related to the Epson XP-625 ink cartridges that are being used by the printer. You will have to change the Color Density settings from the Paper Configuration dialogue box. Check the settings of the media in your system. It should match the paper that you have fed into the printer. If you want to match the colors of your system and the print, you need to select ColorSync. You can also print better quality pictures using the Photo Enhance feature. Making these changes will improve the print quality. You need to make sure that you use a good quality Epson XP-625 ink cartridges to ensure great print quality. Q. My Epson XP-625 printer is printing mirrored images. How can I correct this error? A. You will have to go to Advanced Settings to change the print settings. There is a Flip Horizontal option that lets you print the mirror image of the document. Uncheck the box and apply the changes. You will be able to print the document as it is. Q. The printouts using Epson XP-625 printer appear smeared. What is causing this and how can it be corrected? A. The printouts appear smeared because the media setting of your system does not match the paper quality. You will have to change the settings accordingly. The paper that you are using should be dry and the side that has to be printed on has to face upwards. Check the inside of the printer. The ink may have leaked causing the printout to be smeared. You will have to clean the interiors of the printer using a clean cotton cloth.